Donations are always welcomed and appreciated. Our non-profit works solely on donations and organized events scheduled by our rescue. A Paypal account of your own is NOT REQUIRED to make a donation. Paypal is a secure site that allows you to enter your credit card information and submit a donation of any amount. Just click on the DONATE button below and follow the instructions for payment with credit/debit card. Nevada Frenchie Rescue is a non-profit 501(c) (3) that operates on donations. All donations are tax deductible. Some employers will company match your donation. So please check with your employer about matching availability. Your entire donation supports the rescue organization, rehabilitation, and the rehoming expenses involved with each French Bulldog in need. Every penny counts and is greatly appreciated. Below are a few of the French Bulldogs that were in need of rehabilitation and veterinary care before they were adopted into their forever homes. In most instances, rescues come to us with medical needs that can even include major surgeries to ensure their survival. Every French Bulldog taken into our care is provided with a complete health check-up upon arrival and all health concerns are addressed including spay and neuter if applicable. With your help of donations, we can put a twinkle back in their eyes and ensure their remaining years will be full of care and love. 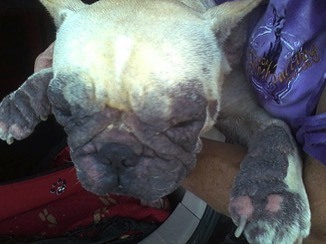 Kirra is a three year old Frenchie who suffered from severe skin allergies resulting in bacterial and and fungal infection over large areas of her body. The infection was so severe that here eyelids were obstructing her sight and her lashes were abrading her cornea. 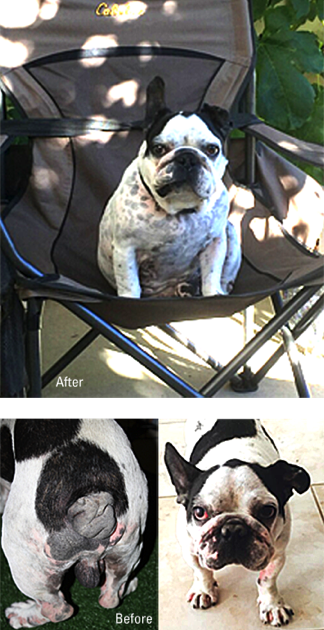 After visits to a Veterinary Dermatologist for testing and special medications, her skin has significantly improved. Kirra still requires medications to address her sensitivities but her hair is growing back and her vision has improved. Paisley was owner relinquished at eight months of age with a malformed urethra to one of her kidneys. The kidney itself was beginning to die and a surgery was her only hope of a normal life. The owner's intention was to euthanize. 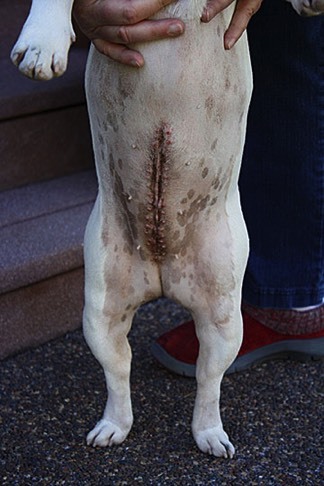 Surgery was performed to remove the kidney and Paisley recovered to live a happy Frenchie life with her new family. Romeo (now known as Jon Pierre) was rescued in Las Vegas. He had such ongoing skin issues that some areas of his body were so swollen they were unrecognizable. An untreated ear infection resulted in a hematoma of his left ear. It took many hours of gentle hand work to remove the long set feces in his pads. His tail was so swollen that he had much difficulty passing stool and walked gingerly due to the extreme swelling is his paws. Jon Pierre now lives in a caring home in Reno with a retired piano instructor. He greets her students and listens intently to their lessons each time they come to visit. His favorite spot is under the piano bench. He is happy, health and loved. Aside from much needed health care, very few French Bulldogs we rescue are spayed or neutered. These procedures are a prerequisite of adoption and the expenses are incurred by Nevada Frenchie Rescue.